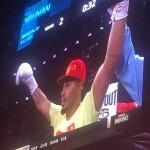 This past Saturday night in Brooklyn at the Barclay’s center Junior Younan AKA “The Young God” put his 6-0 record to the test vs. 6-3 Mike Sawyer in a light heavyweight contest. The fight was the first of many to come for Brooklyn native Jay-Z’s boxing promotion “ROCNation”. Miguel Cotto vs. Daniel Geale. This was Juniors first fight since signing with “ROCNation”. Junior overwhelmed his with quickness and thudding left hooks. Mike went down once on both the first and second round before Referee Tony Chiarantano stopped the contest. 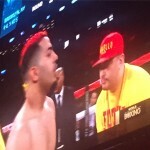 Junior is now 7-0 with 6 KO’s and looks to make a quick turn around.